They love reading in small towns! The New Richland library recently relocated to the historic Odd Fellows building. It took a great effort to preserve the building and find a new use for it. One of the best aspects of my continuing book tour is witnessing the immense support small communities give to their libraries and to reading in general. Case in point: New Richland, Minnesota. New Richland (pop. 1,200) recently moved its library into a historic building on the town’s main street. 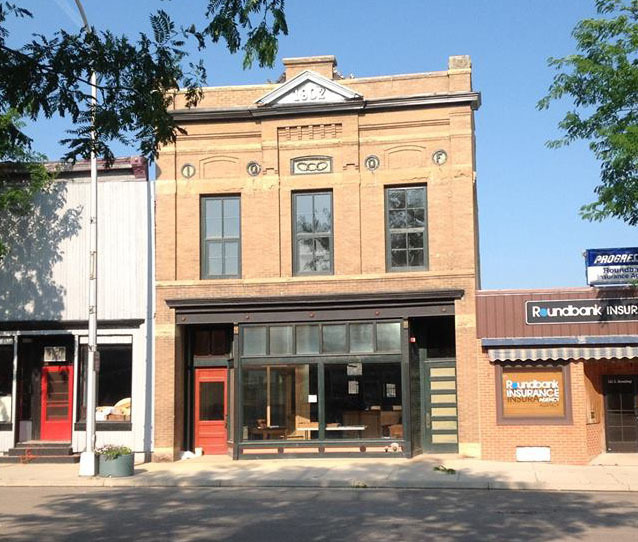 Read more about the effort here to save the former Odd Fellows building from demolition. Not only do they love books in New Richland, they love history! I gave a reading there on November 18 as part of the library’s grand opening celebration. Between 50-60 people showed up: the library was packed! A Monday night, on a chilly November evening, in a small town and dozens of people show up? Fantastic! 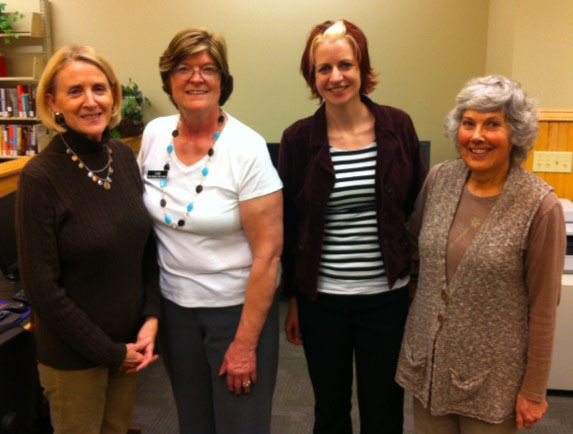 The fantastic library staff and volunteers! Mary (on the right) was my excellent guide throughout the day. My high school English teacher, Mrs. Praxl! I remember her Brit Lit class so well. Ah, Chaucer! Think of all the work our librarians do for their patrons and local authors. I heard from one gentlemen who said he stopped in the New Richland library one day and the librarian handed him my book because she thought he’d like it. 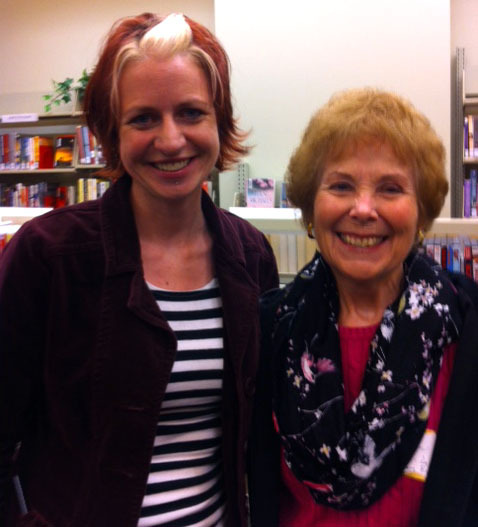 Authors depend on librarians for word-of-mouth–what would we do without them? I spent the entire day in New Richland as I spoke to several classes at New Richland-Hartland-Ellendale-Geneva school (yes, this is the area of Minnesota where several small towns have had to consolidate their schools). The entire day was well-organized and effortless. I heartily thank all of those involved, especially Mary, who chaperoned me the entire day! My cousin, SueAnn, was there. Faribault has several Little Free Libraries and I expect, if you inquire, you will find some in your area to which you could donate. I also wanted to add that your speaking with students in your home region certainly must inspire some young writers. I remember seeing this empty building when I was in New Richland the summer before last. Sounds like the perfect use for an historic building. Residents of small towns, I think, really appreciate places like a library, perhaps more so than larger communities. My hometown of 350 has never had a library. But in the summer of 2012, Todd Bol, co-founder of the Little Free Library, donated a LFL to Vesta. I worked with him and several community leaders to make this happen. The library has since expanded into the Vesta Community Cafe, where bookshelves have been added for even more books. Once I finished reading and reviewing your book, I donated it to the LFL in my hometown. 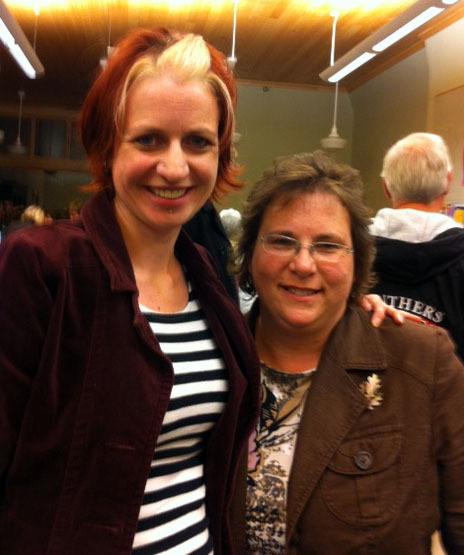 Kudos to all those folks in New Richland who welcomed you and who embrace books and libraries and reading. How great that the little free library has expanded in Vesta! I have so many books I could donate–I really need to look for a place to send my books. Time to cull through the titles, for sure!